Take the worry out of launching a new product by involving your consumers in the design process. A Product Concept Sprint is tailored to engage your target audience in a series of activities designed to get you deep insights on your new product concepts. Make sure your product is solving actual problems and iterate as you learn to build the ideal solution in a week or less. Digsite participants use a combination of discussion, photo/video uploads, survey responses, voting, brainstorming, and image mark-up activities to optimize your product concept, relative to your competition. PD Holdings needed to collect feedback from the consumers on two new product concepts they were going to pitch to a major retail client. 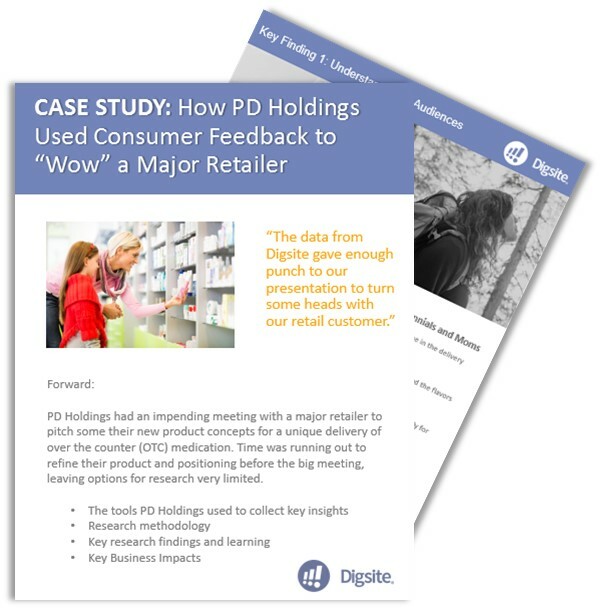 Even with a tight timeline, PD Holdings got the insights they needed, including a better understanding of the key benefits of this new product for target customers. This validation gave their presentation the "punch" it needed to turn heads with the major retailer.